Life with the Lashers: Bella is 10-Months-Old TODAY!!! It's hard to believe that I'm writing Bella's 10-month update, because in my mind, it feels like just yesterday that I was announcing my pregnancy and anxiously awaiting her arrival. Now that she's been a part of our lives for 10 months, we really can't imagine life without her. She is such a blessing and if every child were like Bella, then I'd gladly have 10 more children... okay, maybe 2 or 3 more. Clothing Size: Bella seems to be outgrowing her 9-month pajamas, so I recently ordered some pajamas from Old Navy... in size 18-24 months! I was going to order the 12-18 month pajamas, but I figured we could get more use out of the larger size. Sleeping Pattern: Bella must have missed her own bed because she has been sleeping VERY WELL since we returned from Baltimore. We have totally ditched the middle of the night feeding and Bella has been sleeping through the night. We put Bella to bed around 8:00pm and she wakes up around 6:30am. Needless to say we are all VERY THANKFUL for her new sleeping habits. Bella is also napping twice a day for 1.5-2 hours each nap. Eating Pattern: Bella's eating habits have been a little iffy lately. She is drinking her normal bottles, but she sometimes refuses solids. We still try to give her solids, despite her refusal, but with a little patience, she eventually gives in and eats. She is great at picking up food off her tray and putting it into her mouth. I would like to note that she may be a "south paw" because she seems to favor her left hand. Milestones: Bella has 5 teeth (3 top teeth and 2 bottom teeth) and is working on tooth #6. She is a trooper when it comes to teething, but can be a little fussy when beginning to cut a new tooth. Bella is army crawling but still prefers to roll her away around. Bella learned how to play "Patty Cake" and says (a variation) of the phrase and claps her hands together. Bella is a little parrot. She tries to repeat words that we say and her most recent words have been "car", "dog", "good girl" and "hi." She is so smart and she is going to be quite the talker when she's older... I suppose it runs in the family?!? Friends: The usual motley crew of characters, including, Connor, Layla, Taylan, Luke, Camden, Carter, Tyler, Lily, Gia and Logan. We haven't seen our neighborhood friends recently because everyone has been sick. It's so much fun to see the babies grow up together and it's been great to make mommy friends. Bella has recently taken trips with her friends to Busch Gardens and the Florida Aquarium. Current Events: There has been much unrest in Egypt as the citizens of Egypt have called for President Mubarak to step down. Protests began several days ago and seem to be heating up. Two police officers in St. Petersburg were killed in the line of duty. A mother in New Tampa murdered her two teenage children for "mouthing off". Needless to say, we've had some very sober days, and we're hoping for good news soon. Our friends and family up north have been experiencing a very active winter storm season... as have our friends in the Mid-West. Better them, than us! let it snow, let it snow, let it snow! 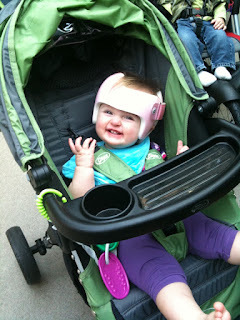 Bella has been in her helmet for almost 2 months and is doing very well. The specialist seems pleased with her progress and we go for a scan in about two weeks for exact measurements. The torticollis... oh the torticollis... Bella has been in physical therapy, twice a week since October and I'm really not sure if her condition is improving or not. Some days her neck appears to be straight and other days her neck appears to be tilted. Hopefully another few months of physical therapy and maturity will help her overcome this. Please continue to keep us in your thoughts and prayers! Well, that's all from Casa de Lasher. The countdown until Bella's 1st Birthday is underway... in t-minus 2 months! Happy 10-Month Birthday, Isabella Eve!